It’s probably the most common question a parent gets when their baby passes 6 months of age. Personally, I dreaded the question. The thought that my son Javi might not be keeping up with the Joneses (or Baby Jones) was the cause of much anxiety for me. Looking back on it now, of course, the whole thing seems silly but that’s only because I have bigger things to worry about; like how I’ll get Javi into the right college (never mind how to pay for it). The worry was all mine. Javi never gave crawling a second thought. When my son had had enough practice raising his head and scooching around on all his other body parts, he eventually got around to pulling his knees up under his tummy and off he went. What’s the big deal, dad? And so I had worried for nothing. I learned that constant worrying about milestones did nothing but add another level of anxiety to that of any first-time parent. I spent more time concerned about crawling than I did watching my little boy experience the world around him. And I did nothing to help him crawl – because, quite honestly, I didn’t know how to support him. The only help I really could have given him would have been to assist him with age-appropriate activities to prepare him for crawling. I could have put him on his tummy more, helped strengthen his limbs, put toys in front of him to help him understand that he could move himself forward. Instead I just stared at him, silently willing him to crawl so I could check that off of his list of things to accomplish and we could move on to stressing out about walking. Parenthood is stressful enough without adding some unreasonable set of expectations about hitting every milestone at the beginning of the range. Babies are unique and they do things at their own pace. Some will go faster, some slower. The best thing we can do as parents is to just do the next right thing in supporting their development. If you are worried about crawling, check out the Activities by Milestone (and then choose Crawling) on the BabySparks app. We have 20+ activities that are designed to help prepare your baby for this particular milestone (and 7 others). While we are firm believers in not micromanaging milestone progression, we also know that there are some babies for whom missing milestones merits further consideration. So pay attention, track progress, and keep an open dialogue with your pediatrician. 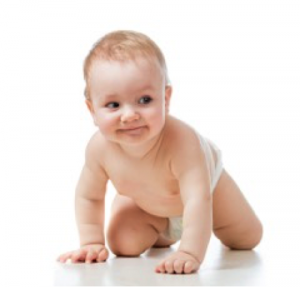 But be confident that the vast majority of babies crawl (and stand and walk) when they are ready. Once you do have your baby crawling – keep them there for as long as possible. Beyond tummy time, it is one of the best things you can do for your baby – their fundamental core strength comes from that critical time on the floor. But we’ll write more about that on another day.